Last year I took a HomeDNA Skincare test that told me all about my skin and how it functions (see that post here). It was so insightful I was excited to try another test, this time about my weight. I've always been very conscious of my figure but when I hit my mid-30's it became a bit of an uphill battle to lose any extra pounds. I figured I could use all the help I can get to figure out if there are genetic factors working against me and what I can do about them. 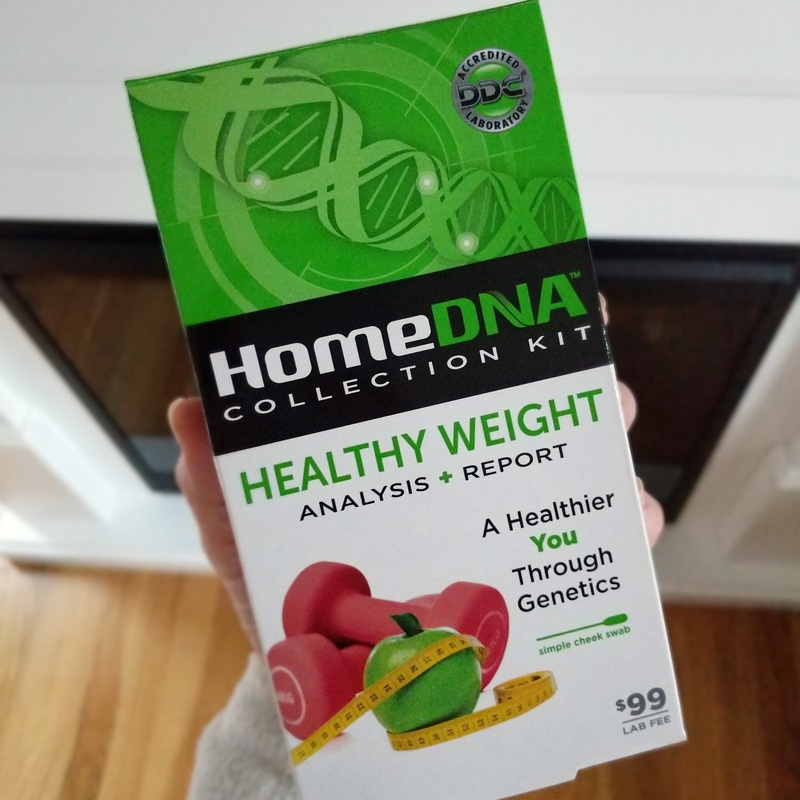 The Healthy Weight Kit is $119 on the HomeDNA website but you can use code HW50 to save $50, making it only $69. It comes with sterile swabs to collect a DNA sample from your inside your cheek (quick and completely painless! ), and a postage-paid envelope to mail your sample to the lab. After a few weeks, my results were in and I was able to view them online. I'll give you a summary of their findings, but the entire report is 72 pages long so I won't publish it all here. It includes not only my results but recommendations on how to get the most out of the information, including sample diet and exercise plans. 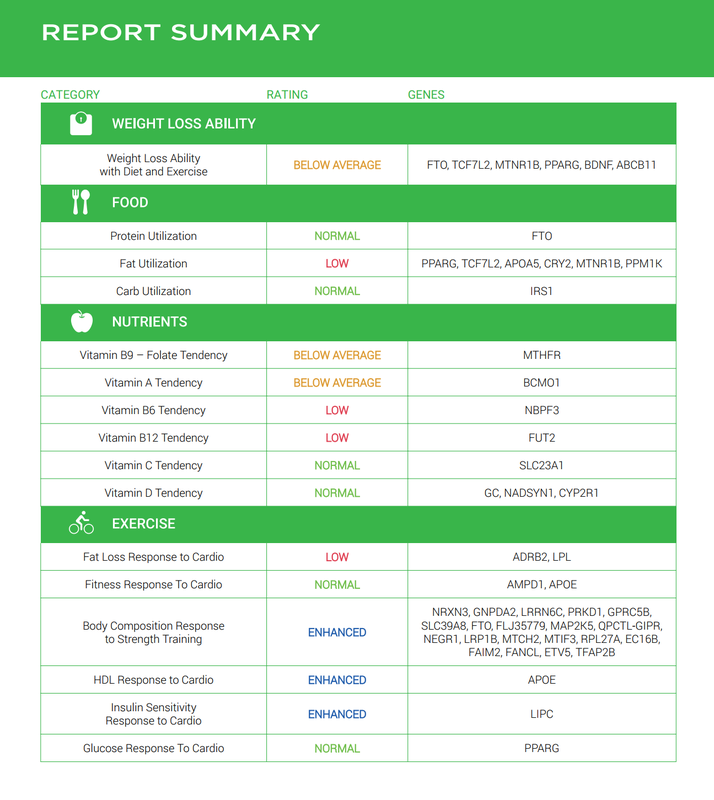 There are 4 main categories that were tested and they include my ability to lose weight, how my body processes food and nutrients, and how it responds to exercise. The test found that my ability to lose weight through diet and exercise is Below Average. This doesn't mean that I can't lose weight, it just means that if I follow the same diet and exercise program as people with a more favorable genetic makeup, I won't lose as much as they do. It also puts me at risk for re-gaining everything I've lost. This is definitely not good news but I'm glad I know this information so that I can work harder and be more diligent in my diet and exercise plan. 2. Food- The test looked at my ability to utilize carbs, protein, and fats. When it comes to protein and carbs, my genetic response to them is normal. This means that I won't see greater weight loss with a high-protein (like Atkins) or high-carb diet like other people who have an enhanced genotype. More bad news when it comes to fats...my utilization of fat is low meaning that my body is sensitive to too much fat in my diet. I may also have a reduced level of fat oxidation, or fat-burning ability when I eat a high fat diet (such as Atkins). 3. Nutrients- The test looked at factors that might cause my body to be low in certain nutrients that can help with weight loss. Please note that this doesn't test your actual blood levels of nutrients...it just tells you if you have a tendency to be low or high in certain vitamins. When it comes to Folate and Vitamin A, my body has the tendency to have below average levels. I know this because last time I was at the doctor my levels were on the low side and I was told to supplement. My vitamin B6 and B12 levels have a tendency to be low and again, this wasn't a surprise since these levels are always low when I have blood work done. This is a good reminder to make sure I'm supplementing or getting enough of these vitamins in my diet. When it comes to Vitamin C and D, my tendency is to have Normal levels. More bad news...my genetic response to getting the recommended cardio (3 days per week at a moderate intensity) is Low. Basically, if I follow this type of program, my fat loss will be minimal. Instead, I need to aim for 5-6 days of cardio exercise working at a high intensity (I'm feeling tired already!). They also recommend trying HIIT (high intensity interval training) workouts. Some good news! My response to resistance training is enhanced. The test says that I will be more likely to see reductions in body fat from weight training. This is good to know because I rarely pick up my weights anymore, but I will definitely start resistance training again. Another bright spot is that my HDL (good cholesterol) levels have an enhanced response to cardio, so even though my fat loss may not be affected much by doing cardio, I still have a reason to do it. HDL is a blood protein that carries cholesterols to your liver, rather than lingering in your blood stream and creating plaque on your artery walls. Overall, I found the HomeDNA Healthy Weight test to be extremely insightful! I now know which kinds of exercise my body responds best to, the types of foods and nutrients I should be taking in, and that I have a natural tendency to gain weight so I need to stay diligent and work harder at my weight loss goals. 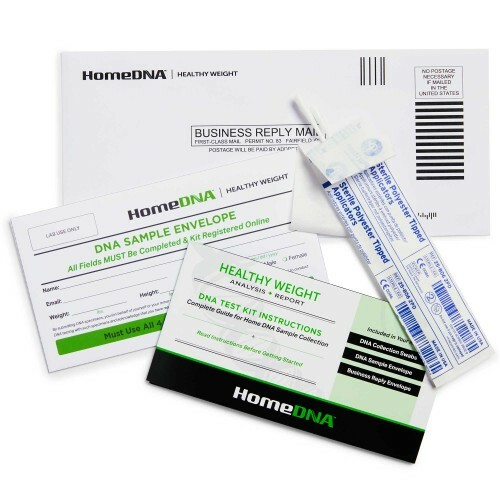 To take your test, please visit HomeDNA.com and don't forget to use code HW50 through April 30th to save $50! What are your thoughts? Are you interested in trying this one? This is so interesting! I really want to try this because I do lots of cardio but it's mostly walking so the intensity isn't very high. My friend who walks with me loses weight no problem but maybe I'm like you and need to do something more intense to see results. Thank you for this post! Wow! It's crazy that your DNA can shed so much light on why you might have issues with weight loss. Very interesting, but I try to keep in mind the saying that "DNA is not destiny." What I mean is, we may have genes that according to medical studies **correlate** with certain conditions or abilities, but they aren't absolute. Don't get me wrong; I'm very enthusiastic about DNA profiles and studies and this is a great post. For myself, I got the Ancestry.com ethnicity test, then downloaded the raw data and uploaded it to a site (Promethease) where I got a very extensive report for $10. It is not very user-friendly, though, and I wouldn't have done it if I didn't have a medical terminology background. Definitely got some things from it to discuss with my doctor at my next checkup! Wow, fascinating. I guess I never thought much about how DNA could affect weight loss. I find this very interesting. At least now you know what to tackle to get your body to respond the way you want it to. Thanks for a great and very informative post....and the discount code! I think I am going to order a kit. Does this company give you any of the raw genetic data?